Originally conceived for the 2011 exhibition ‘La Naturaleza Es Sabia,’ organised by Museo Reina Sofia in the Abbey of Santo Domingo de Silos, Dujourie’s series Ballade consists of twenty sculptural imitations of flowers known for their association with ancient medical knowledge. Since antiquity, plants such as Linum, Trifolium and Calendula, amongst others, have been used as herbal remedies to cure a great variety of ailments – linum for burns, for instance, or calendula for headaches. Images of such flowers were collected by Dujourie from old medieval codices as well as botanical studies, like Hortus Sanitatis, the first encyclopaedia of natural history printed in 1491. Here she references the relationship between knowledge and power, pointing to how the empirical understanding of plants’ medicinal qualities was kept hidden in monasteries, where illustrated herbal guides or oral lore represented the only means through which such information was transmitted from one generation to the next. Similar to the artist’s velvet works from the 1980s, Ballade has a predominately theatrical quality. Like deixis in linguistics, in which words or sentences cannot be fully understood without greater contextual awareness, in Ballade Dujourie encourages the viewer to engage with the work’s story, traversing beyond its immediate physical appearance to nurture a deeper understanding. Further odes to nature are found in Dujourie’s clay sculptures, positioned on the gallery’s floor or raised on pedestals. Titled Sonate and Epigramme, the quasi-similar shapes, whose rough and textured appearance evoke scattered leaves or fallen bark, weave together to create an immersive installation of forms. 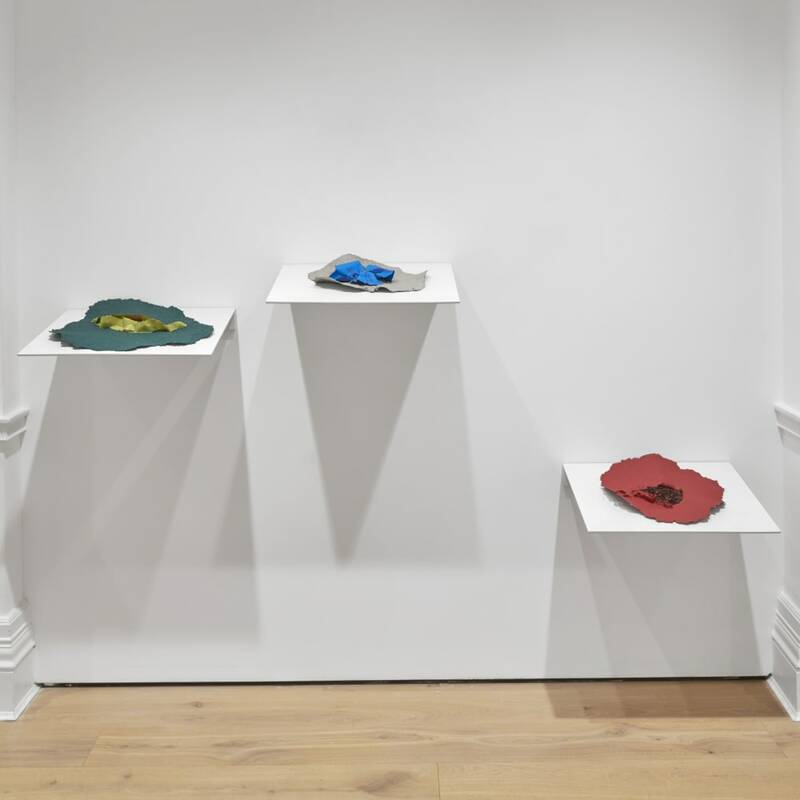 The essence of the material – mineral composites – calls again to the earth and the artist’s literal manipulation of it, moulding and morphing the clay with her fingers, palms and fists. The works’ minimalist and repetitive qualities snap the viewer to attention. Far from being passive, the sculptures activate both the gallery and the beholder, shifting attention away from the materiality of the work to reveal hidden meanings beneath the surface. The work of Lili Dujourie (b.1941, Roeselare, Belgium) provokes an astutely intellectual yet poetic engagement with the world around us through various mediums, from painting and sculpture, to photography, collage, video and installation. Described as an ‘Old master in Postmodern Garb’, Dujourie operates at the intersection of minimalism and conceptualism, consistently and systematically challenging the subject position of the viewer through clever experimentation with material and form. After making her debut with sculptures made of natural materials in the late 1960s and early 1970s, Dujourie’s practice shifted into photography and the experimental realm of video art in the 1980s. With these new media, she embraced not only painterly and sculptural considerations but also the gender and identity-related issues of the time. The duality of movement and standstill inherent to film – as well as other juxtapositions – fed her later three-dimensional work. By transforming the physically and culturally determined properties of certain materials – such as velvet, marble, plaster, iron, lead and clay – the artist created sculptural forms that prompted deeper epistemological engagement. Indeed, all of Dujourie’s work questions the ‘truth’ value attributed to observation, suggesting instead that reality involves both acts of revealing and concealing, not only that which we can see but also that which is hidden from us. Ballade forms part of the gallery's 12-month programme dedicated to supporting the work of female artists. Titled 100% Women, the programme aims to remedy the gender inequality that persists in the art world and encourage wider industry action through debate, dialogue and collaboration. 100% Women will pursue its mission through a combination of gallery exhibitions, art fair presentations, artist talks, a film and lecture series, external collaborations and digital exhibitions hosted on the gallery's new online platform.